You don’t have to skip to the end of this review to find out our opinion of Ford’s 2011 F-Series Super Duty pickups. At this moment, there’s no doubt that Ford has once again raised the bar to new levels of performance and productivity for heavy-duty pickups. 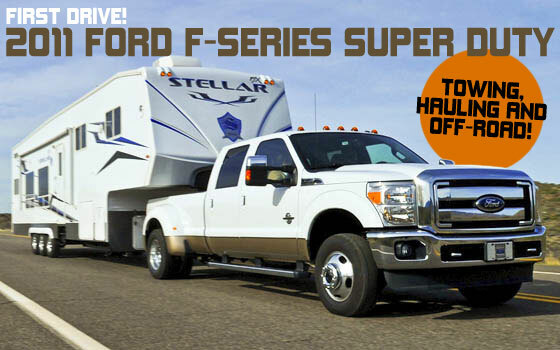 The Super Duty continues to be the standard against which its competition will be measured. Read on and find out why. HD pickups are the workhorses of the truck world, and like pack animals that farmers used to depend on to deliver their crops to market, when a work truck is out of service it causes more than aggravation — it can cost hard dollars and time. And these trucks are worked hard. Ford says 97 percent of Super Dutys are used for towing, according to Super Duty Marketing Manager Brian Rathsburg. A $50,000-plus price tag isn’t uncommon today, so two of the most important considerations a buyer might think about before committing their hard-earned cash are: Will this truck be able to perform the jobs that I need it to do, and do I feel confident that it will complete them successfully? Ford is answering those questions by making many improvements to the Super Duty just three years after its last major update, but its most significant changes include two new gasoline and diesel engines and a new six-speed automatic transmission that’s used for both versions. The ZF six-speed manual transmission has been dropped from the lineup. Both engines have been engineered from scratch. The standard 2-valve 6.2-liter V-8 gas engine develops 385 horsepower (at 5,500 rpm) and 405 pounds-feet of torque (at 4,500 rpm), up from the old 5.4-liter gas V-8’s 300 hp and 365 pounds-feet. But it’s the 4-valve 6.7-liter Power Stroke V-8 diesel engine that’s the darling of the powertrain lineup. It pumps 390 hp (at 2,800 rpm) and a staggering 735 pounds-feet (at 1,600 rpm). Roughly 60 percent of Super Duty pickups are ordered with diesel engines. AND Don’t forget – come to Waldorf Ford on Thursday March 11th at 5pm for your very own Sneak Peek at the 2011 Ford Super Duty. We will have one on display and a specialist on hand to answer your questions. Food, Fun and doorprizes, including $10,000 in Ford Custom Accessories! This is the first time I visited your blog and I actually like it. I bookmarked it too. I love sites about cars and I want to share one with you. It's about private label detailing products. They manufacture products and use private labels. It's like you made them. It's so cool.